Romy catches up with co-founder, Amanda Lewan to hear about the most recent expansion of one of Detroit’s hottest hippest co-working spaces. Listen in to some of the secrets of the success including the special nature of the diversity in members and programming. Romy: Thanks for joining me for another episode of the Bonfires of Social Enterprise! This is Romy and I want to thank you for your loyalty and following. It keeps us all going around here! 1. Bamboo is anti-bacterial - bamboo has natural pest-fighting powers, thanks to the plant's unique resistance to bacteria and fungi. 2. Panda’s Did not always eat it like you see in pictures. - At some point, pandas came to love the taste of bamboo and hate hunting, giving us the peaceful and herbivorous, bamboo-munching creatures we know today. Bamboo tastes delicious, it grows on every continent, and Bamboo is stronger than steel - In compression tests, bamboo comes out stronger than brick, wood, concrete or steel, meaning it can hold more force than any of those materials. Some scientists even theorize that a length of bamboo 10 centimeters across could hold a 11,000-pound elephant -- though that particular experiment has yet to be attempted. I hope you enjoyed this Fun Fuel. This is Hudson Robertson. Enjoy the show! Yes, we just opened up at our new location, 1420 Washington Boulevard on floor three. The building is called the Julian C. Madison Building, so we're super pumped about it. It's a beautiful building right downtown. It's locally owned by a wonderful family. The building's named after our landlord, Sharon Madison's father, Julian C. Madison. He was a history-making entrepreneur himself. It's very inspiring to live that sort of similar path with our inclusive entrepreneurial hub here. Yeah, can we hear a little bit about that story? Yeah, so Sharon's father and grandfather were trailblazers. They were the first and third African American engineers in the state of Ohio, and I think his grandfather was one of the very first engineers, African American engineers hired by the federal government. When they bought this building, they named it after her father. One of the things they always described it as he always had a spirit of ... A belief that one should take their life into their own hands, and create with it. I guess he [inaudible 00:02:33] always give back and help raise up the younger generation for their own businesses. It was a really good fit for us seeing a great shared workspace for entrepreneurs and creatives, and fostering and sharing those values of inclusion and diversity. We're super pumped. I think it's really good to partner with people who share your values. That was something that was really important to us. Oh, my gosh, what a great place for a co-working space, especially as diversified as you guys are. That's wonderful. What made you guys decide to make the jump into a bigger space, was it obvious you were just outgrowing? It was a little bit of both from the very beginning. We took a very lean start up approach. We started the first [inaudible 00:03:24] with four friends in just a 3,000 square foot space and some IKEA furniture. Along the way, we really did a lot to build the community. We hosted a lot of events, we listened to our customers, and we tried to improve the space as much as we could, but just kept hearing over and over that people needed more dedicated and private space. We knew from the beginning we were missing a bit of a market, and also that's just what our community really needed. By the end of ... Right before we moved, we were definitely getting super busy. We do a lot of events we didn't really have an event space or events would always overflow and take up the co-work space. We're really pumped that we now have an event space too inside of our new co-working space, and the building we're in has a big beautiful event space. We have a more freedom to grow and explore new programing and even expand to other floors if we need to. Wow, that's tremendous. I love that for you guys because you guys really do have some thoughtful events that are ... There's a lot of other similar organizations to yours around the country that sometimes they just have speakers, and I always find they way I look at your event lineup that you're always very thoughtful about the types of content that you bring to all your members. Thank you, I really appreciate it. We frame it like we want our members to fell inspired while they're here. We want to provide access to entrepreneurship, and inspire them to grow. We hope most of our events are fun and inspiring. We do let members do a lot of events, too, so that they can use us as a launching pad to grow. A lot of our workshops, too, we try to focus on growth. A typical incubator, you might go through a really formal program, but at Bamboo, we're super flexible, we'll just have a lot of different workshops. You can pick and choose, and learn whatever you need to do. We try to be well rounded, so we've done meditation, we've done networking, we've done all the content stuff to keep people improving themselves personally too. Since we didn't hit that the first time when we did, interviewed you on season one, we mostly talked about you guys as a co-working [station 00:05:36] and just a high-level diversity in there. You just started to touch on your role as an incubator and will you just definite that a little bit more for some of our listeners? Yes, I think Bamboo, for us, we want to be a very flexible brand and community. We are a platform for people to grow. You can come in and use the workspace, but what really differentiates us besides a very inclusive culture and providing a lot of access to resources, is our programing. We try to always have workshops, and they're very well-rounded. Everything from meditation and self-care, to vision boarding sessions, to high growth happy hours, or in-depth lawyer sessions. That's something we're really going to be in the new spaces versus an incubator program or an accelerator, sometimes we sign up for three months, and you have to be there nine to six. That doesn't really work for everybody. We try to really just have more, shorter-term flexible programing. Maybe you're a mom working full-time, and you come to the co-working space for three hours in the afternoon, but you can do a free info session or an in-depth workshop. All kinds of stuff. Yeah, that's powerful. How did you work up the courage to leap into a larger space, did you ... Some people save up, some people get a loan, some people just do it. Did you stack up memberships? Just encourage those who are or might be thinking about expansion. What was your strategy for it? We had a bigger ... It started, we always had an idea for expanding, so back when we were in our smaller space and just first starting to build the community, we really wanted to do a building, and work up to a long term plan. Along the way, we met the building owner here, and we were really excited and intrigued with just sharing those values that I talked about with her, and the location of the building felt perfect. She had two floors available, so there was some room to grow. It's funny looking back; we had this [inaudible 00:07:46] do a whole co-working, maybe even co-living building downtown, because we knew there was this energy and this interest, and we were listening to our customers. The expansion we did was a little bit smaller. Instead, we just decided, let's go from 3,000 to 6,000. Let's test out our new product offering, private offices, and dedicated desks. Once those are full, we can then do another floor if we need to. Maybe long term, look at buying a building. It seemed to be more in our approach, which was growing organically, and we did take a small business loan out, and we got a grant from the city of Detroit. Those two things were tremendously helpful for the build-out of the space, but we did it still. I mean, there's some spaces where they spend two million dollars on their build out. We spent just a little over 100 thousand, and it's turned out really really nice brand new furniture. Then we partnered with everybody we could locally to just make it happen. I think that's one thing to be aware of, you might have this bigger vision of going into a huge building, or I want to be this, and sometimes you just need the next step to get there and just keep growing and refining and getting better and better. Yeah, there's so much to learn when you take that next step to a new product or new service or expanding a location. Hiring people. Every time you expand and some way, there's always some learning that comes out of it in its current condition. Yeah, well that's exciting. Almost a little bit of both. I just feel the way you guys did that was so smart. I'm glad that you've found a connection that makes all the difference with the landlord. It did, and it definitely took a lot of time. I think things take longer than you realize. We actually secured the funding pretty quickly, I think because we had been working on our business plan, we had been around for a couple of years, we had built those relationships. It took a little longer to get the lease all together, and then make the final move over. That's okay. People should know. Sometimes it looks like overnight success, but it's really not. It should take a while. Right. That's a good word and encouraging for everyone else. We skipped over this, but this is a really good sign of a co-working space when people want to stay and have a private office. Literally, want to move in more fully. That's its compliment and marker of success, right? That's really good to hear. Our private offices filled up right away. We did, and I think you asked me did it create demand or a little bit more about our strategy. We did, once they made the decision, "Okay, we like this building, we like this landlord, we're going to try to start pushing things in order here," it took about a year, maybe a little over a year to finally get here. All along the way, we've built up wait lists, and some of the content, some of the people on the lists are old, but some of them have been really great, for the past three or four months. You can build, do things while you're putting everything in order to get those first customers. I think that was pretty helpful along the way, continuing to build our own brand following so that people would share and recommend and bring other people in. Right. Thanks for circling back on that, because it is, you can keep selling I guess the message I want to say. While you're expanding it is important not to stop selling and keep selling. Like you said, there might be just a few folks on the list that are a little bit old by the time it's time to queue up, but it's always important to keep selling during expansion, right. Yeah, so now we officially opened just two days ago. Now it's time to really just shell the rest of what's available. You mentioned hiring; we're going to try to hire. We've had volunteers at the space, we're going to try to have part-time fellows, folks that maybe are in between jobs, or just starting up, or maybe they're college grads. They want to contribute to the community and get a lot from being in the community. We're going to test out, can we have part time folks who are just really engaged, really want to be here versus just having an office manager. A typical office manager role, we didn't necessarily need, we want someone who's going to be in the community, too. We're going to start hiring our first couple of folks here in the next few months and see how that goes. It should be fun. Then I can remove myself from the role of the community manager marketer, and work more high level on where do we want to take our brand next. We want to do more locations. We want to launch a technology. I know for sure we're going to step up and do a lot bigger programing and events next year because that is expended value. It keeps people excited and happy, and always engaged with the co-work community. While we're on this great moment of [inaudible 00:12:33], why don't we say for anyone who might be listening in Detroit, what's your pricing, and for a co-working desk, and private office? Yeah, so we try to have tiered pricing, so we have a 40 dollar membership. We call that our starter membership. That's having a mail address downtown and access to some events and resources that you can just get started in being in the community, and having that official downtown address. Then the next level's open co-working, and that ranges between 125 and 175, depending if you want to commit two years, six months, or a month to month. Dedicated desks are 325. Private offices, they're a little bit pricier, they're 800 and up, but it's really good, you can work your way out from, all the way from the beginning of starting to co-working, getting a desk, and then growing into your own office if you want to. 800 is still just peanuts compared to doing it on their own. Yeah, it is. The other big perk is the flexibility, right? You could do one-year leases and offices, six month leases on desks, or month to month on open, and you need to actually get a lease. Now that we've gone through the process and got a really large lease, I can tell you there's a lot you have to do. You have to really be ready to take that risk. It's definitely really flexible for startups, small teams, creative people. Yeah, well that's exciting. What are memberships open there at your new space now? Are they all open? I think you said the offices are filled. All of our offices are booked, but we have a wait list, so you can join the wait list by just reaching out and letting us know. We're looking at expanding to another floor. That one might be more offices as we've had a lot of demand there. Then dedicated desks are available, and those are a good option if you have just a couple of people who might want to be in a more semi-open area, but still have a little privacy, or you're just an individual who works at home, and not going to lock up your stuff and always have your computer out. That tends to be a really good option, too. All right, well that's exciting. I know you've got a great line up. While we've got it all right here, let's tell the listeners where they can find you on your social media and your website. 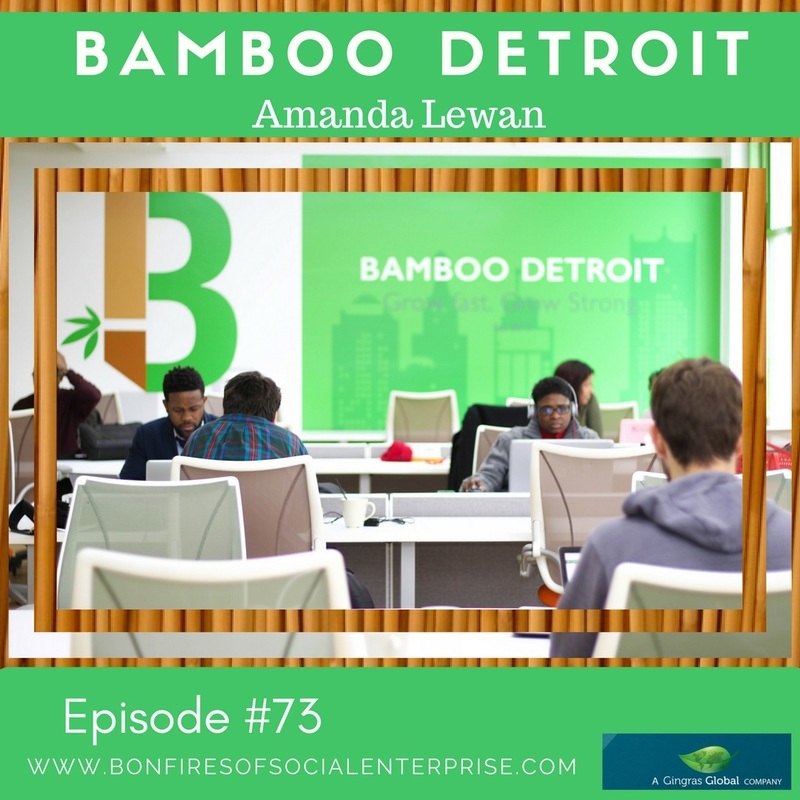 Oh, yeah, you can find Bamboo at bamboodetroit.com, or BambooDetroit on Facebook, Twitter, and Instagram. I'm Amanda [Jenn 00:14:57] at Twitter, and you can always reach out to me if you want to come by, see the space. Drop into some of our events. Most of them are open, and they're free and low cost to the communities. We'd love to see you at the brand new location. Well, awesome. That just wraps up a cool commercial. Let's, we've got a few more minutes if you've got a few more minutes I want to see if we could ... If I could just ask you some questions about some of the things that might have surprised you from the last time we interviewed you. Back then it was almost a year and a half ago. Has there been anything that during that time that you think, "Gosh, I'm just surprised it went that way." Did anything stick out? Yeah, I think the two things for me, one of my personal flaws, is that I'm not as patient as I should be. I mentioned it did take a long time to get the lease and all of our finance, and the whole process of really expanding was longer than I realized. That's just something to be aware that have realistic expectations on timing and be patient because it will come together when it's ready. It's better to do it the right way and make sure that everything were ready and ordered, no matter how long it takes. Then that, we also went through a partnership change, so we're down to two partners from four. That was a really good learning experience. I wouldn't say it was a surprise, but I think it was at some point, you do have to transition on and grow as an individual, and be honest with partners. Be supportive and try to make the best of those kinds of changes. I think everything worked out how it's supposed to, and we're going to be set to grow now in 2017. Don't be surprised if people change, if time takes longer. All of those things are natural. We're all human beings just trying to figure out our paths here. Yeah, right. Operative word, I say that a lot. When we have us humans involved, we don't always obey every, all the rules and plans. Yeah, sometimes you have this vision, and you're like, "I just need to get there, I need to expand." For us, it just felt like it absolutely had to happen, like there is no ... We just couldn't stay in our small space any more. It was just; it had to happen. It has to happen on its own at the right time. Get the right people ready to do it. It surprised you about sometimes how long things take. I think, too any time that you apply for a grant or some sort of governmental award, that's always an exercise in patience. Yeah, it is. In real estate, too, I think is a little just more slow moving. You have to wait til things are available, then you have to move in, and [crosstalk 00:17:44] it's a bigger endeavor than I'm used to. I'm really glad we're here, I'm really excited it all came together. Yeah, me too. What things around maybe specifically Detroit that's got you excited right now, that you maybe see or you're excited about in this new year? Well, I think we've got a lot of great momentum starting to build. We have all these great grassroots organizations. I think of us as having a grassroots beginning, starting with the community and then formalizing and growing. We've got Build and FoodLab, and a lot of the trends I see have sort of validated their ideas and their models, and they're also growing with us, I guess. Our friend Tracy and I always joke. If it was a reality TV show, season one had ended. In season one, we didn't really know what we were doing, but we made it to season two which is now ... Everyone's getting more established. It's great to see all these businesses around me also growing. I think we're going to have a great entrepreneurial community, in everything from retail to tech startups, really I think, there's a ton of opportunity in Detroit, and I'm excited to see that it's not just of us, it's people are actually getting their feet in the ground and growing, and staying here. Me too, there's a big difference from five years ago. I think back about what I was doing and the conversations I've had there. There was a lot of us that were dreaming big, and yet stubbing our toe on the small barrier right in front of us like, "Agh." It seems like it's going to take forever but now, you look back, and you're like, "Man, this has, everybody has matured and been strengthened." I just think of it, everyone's been strengthened and almost fortified a little bit. Everybody's supports each other, too, and so I think that's ... 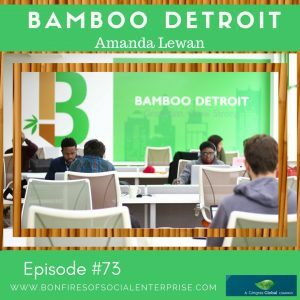 I mean here at Bamboo but also in the greater Detroit community and that's ... Part of it, too, is personally becoming a majority partner. I personally had to step up, and I saw all these inspiring women who have just started businesses or are leading communities, and it just feels like there is opportunity here. There's a lot of people doing great work, and that makes me feel like I can do it too. I know, it makes you feel like your not as much on an island. You can feel it as an entrepreneur even when you're in a co-working space. You can feel alone. I think that's a big perk of being in the co-working space, too. I do too because you can feel less, and you can at least see other people, even though they might be brilliant or have a brilliant idea, everybody hits the same barriers. It's just part of the strategy that happens; it's part of its natural evolution of making your business strong. I guess I just want to say, too, I've watched your business become strong and this word for me about you, every time I think about Bamboo, I think about really growing strong, and you guys really did it the right way. I'm super excited to stay tracking with you. Is there anything else you want to share in an update for the listeners of what you're up to? No, I just think, don't give up in whatever you're doing. If you're and entrepreneurial listening, and if you're just interested in close entrepreneurship, and all the different kinds of investing, come check out, more stuff happening in Detroit. I'm sure [inaudible 00:21:07] made you do a great job of highlighting all of the great companies and leaders here. They probably know and are pretty familiar. Come visit us and come to Bamboo, we'll host you for a day for free, and help you, get connected. I think that's the kind of culture that we really embrace and that the city seems to embrace, too. Good. Thank you for everything you're doing, Amanda, and to your team, and your newly growing team. I'm going to see your space in the next couple weeks. I'll be down, and I can't wait to see it. Romy: Thanks so much Amanda! It was great to catch up on the progress of the great space. It is both exiting and scary to expand and it requires well-thought out plans and a lot of courage! Well done Bamboo team!